Because many people do not grow their own food, industrial farming (and its negative impact on the environment) has flourished. We aim to combat this, creating a produce cultivation machine, utilizing BioBlend and being as low user input as possible. Status as of April 30 - Device is complete and functional! We will be implementing in Sweden, leaving on May 28. 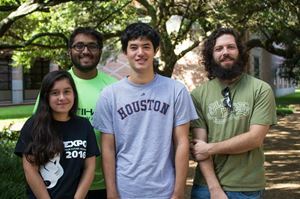 We are Lettuce Turnip the Beet, a team of senior mechanical engineering design students at Rice University that has built a prototype of a produce cultivation machine. Our first prototype consisted of a wooden frame, designed in the shape of a right triangle, on which three large PVC pipes were attached. We used two submersible pumps to circulate water through the pipes, which have holes cut in them to hold baskets for the plants. The water flows over the roots of the plants, carrying nutrients to them before flowing back to the reservoir and repeating the cycle. This prototype has been moved outside into a cage adjacent to the OEDK where it will remain for the rest of the cycle. Using the knowledge gained from our first prototype, we built a second, more robust prototype. It is a completely modularized system that can be customized to fit many different spaces. Currently, the device has two support posts of four modules each, that holds six square pipes. The system is fully operational and has produced at least 20 salads to this point. We have optimized the device such that it is easier to use and requires minimal time commitment, completing two of our design specifications. Other specifications that we have addressed include noise level, device size, light output, and plant growth.